Happy Muffin Tin Monday to you! I'm sad to say I have no muffin tin to show this week. I planned to do it on Saturday with the kids, but I spent that whole day curled up in a ball... the victim of either a 24 hour stomach bug (or possibly mild food poisoning?). I was feeling better mid-Sunday, but then my attention was focused on assisting Owen with his big 3rd grade biography project. There just wasn't time for playing with food. Bummer! One element I was looking forward to including in the Seuess-themed muffin tin was another kiwi guy. The kiwi Grinch, take two. 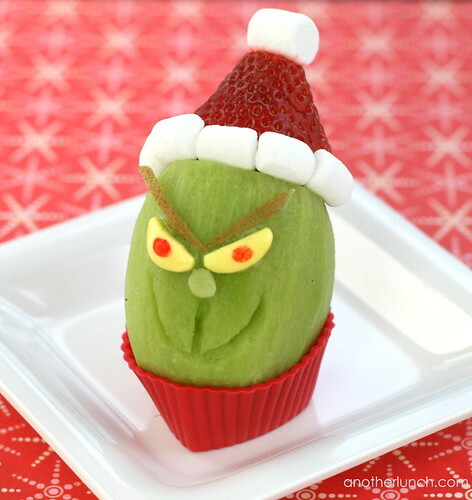 Not many of my food creations make a lasting impression on my children, but that kiwi Grinch is something they talk about whenever something Grinchy comes up. Now let's get on to the link-up! Hopefully some other muffin tin makers have whipped up something Seussy this week! Muffin Tin Monday 4-1-1 is and the schedule for upcoming themes is posted at the Muffin Tin Monday information page. More were added this weekend! I'm so sorry you were unwell. I'm not surprised you didn't feel up to anything muffin tinny! Love your Grinch-very clever!! So sorry to hear you were sick. I also love your Grinch, I can see why he would leave a lasting impression. Cute Grinch! I'm sorry to read that you were sick. I've so enjoyed your ideas for Muffin Meals. My daughters LOVE these special meal times. That kiwi Grinch is so cute! Hope you feel better!